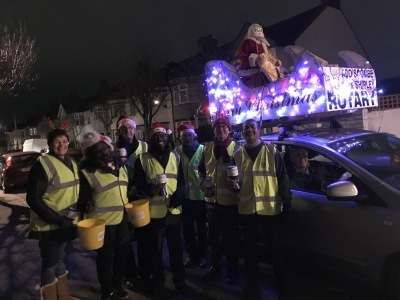 Santa and his Sleigh, with flashing lights and music, is coming to Addiscombe and Shirley on the nights of 3-6 and 10-13 December 2018 for this year's Christmas Charity Collections. 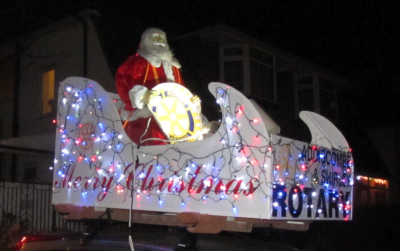 His band of merry helpers will be wearing their bright yellow tabards when they knock on your doors between 630 and 830 pm. Last year we raised over £5,000 for charity but we could not have done it without our very generous residents! Please help us to have another great year. Update: The first week raised a wonderful £2460.84!! Left into Spring Park Avenue (including The Vale), Right into The Glen, Left into Spring Park Road, Left into Shirley Church Road, Left into Hartland Way, Right into West Way, Left into South Way, Left into Temple Avenue, Left into Sandy Way, Left into Colin Close, Right into Shirley Way, Left into The Lees, Right into Bennetts Way, Right into Farm Lane and finish. Addiscombe Road, Whitethorn Gardens, Green Court Gardens/Avenue, Left into Shirley Road, Cross Shirley Road into Glenthorne Ave, Left into Blackthorne Ave, Left into Shirley Park Road, Cross Shirley Road into Bingham Road (Left Hand Side only), Left into Craven Road, Left into Ashburton Ave, Right into Craigen Avenue, Right into Selwood Road, & cross Compton Road to finish Selwood Road. Oak Ave (to junction with Bushey Road), Left into Ash Road, Left into Bridle Road, Cross over to Graham Close/Worcester Close, Cross back over into Bushey Road, Right into Oak Avenue, Right into Links View Road, Cross Bridle Road and turn right to Shirley Way, Left into Shirley Way, Left into Tideswell Road, (inc Girton Gardens & Douglas Drive) Right into Links View Rd, Left into Annesley Drive and finish at the top. Right into Greenway Gardens, Ferris Ave, Right into Lime Tree Grove, Left into Pleasant Grove (including Popes Grove), Right into Shirley Way, Right into Heathway (including Bernel Drive), Right into Lime Tree Grove, Left into Stuart Crescent, Left into Palace View, Left into Eversley Way, Right into Lime Tree Grove and Right into the end of Bridle Road into Palace View and finish. The Charity Tea Party at Addington Palace Golf Club (May 2018), held in conjunction with West Wickham Rotary, raised over £1000 for Alzheimers research. 27 March 2018 - Smile International: One of the most inspiring presentations that we have heard! Rev. 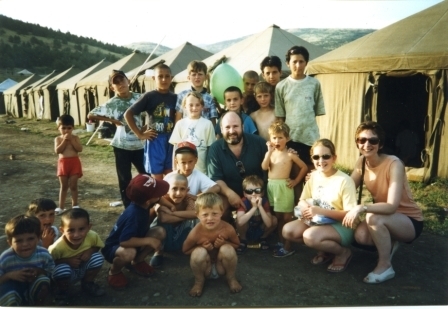 Doubleday, his family and local volunteers, hired trucks which they then filled with food, clothing and shelter, and drove all the way to Macedonia to help the poor homeless refugees at a time of crisis during their terrible civil war. Oz received the President's collar from last year's Presidents, Lynn & Annette, at our meeting on 27th June, 2017. He will serve as President for two years. 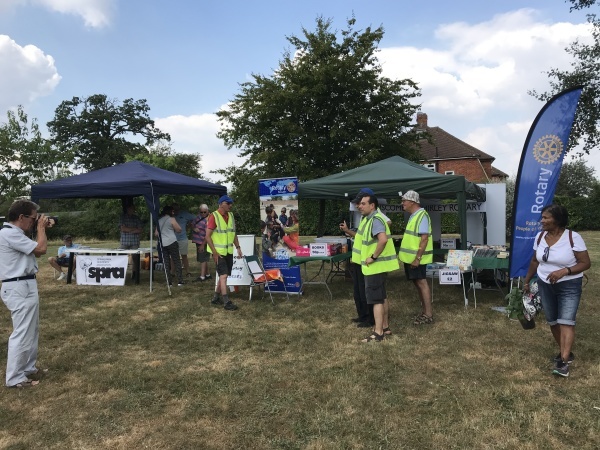 ​We are local residents who help our community by running a few projects every year and fund-raising. You are very welcome to join us at one of our meetings and find out what we do. We meet on most Tuesdays. 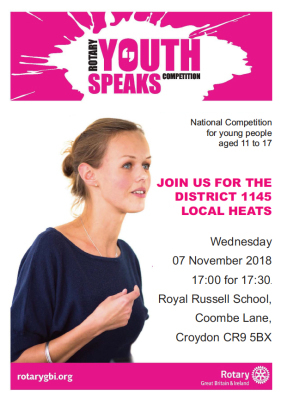 If you like the idea of coming along, please either call or email us in advance. Over 160 tickets were sold for this wonderful event held on the 7th October 2017 in Addiscombe. 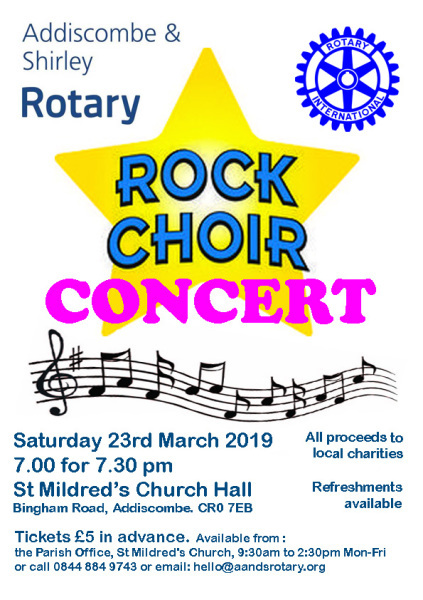 Our thanks go to all the members of the choir who produced a truly stunning performance, and to St Mildred's Church who provided the facility and were so very helpful. Congratulations to Anne Cook in New Addington who won the Hamper with ticket number 203 and Barbara Howlett of Addiscombe with ticket 374 - she won Popchoir membership for 2 people for a full term. 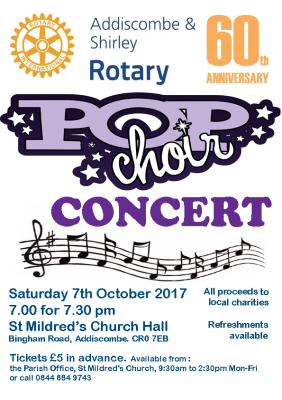 London Air Ambulance, Shirley Neighbourhood Care and St Mildred's Church each received £666 .66 (a total of £2000) raised from this wonderful event. Another fantastic year for Christmas 2017 collections - Please see our Charity page to see who we support. A wonderful evening for Rotarians and their partners to celebrate our 60th Anniversary at The Croydon Park Hotel. The cake was very kindly made and contributed by Janet Ozgenturk . Over 35 members and guests attended, and the raffle raised over £115 for our Charities.